For the last 100 years, research and results reveal that all self-made Millionaires without exception developed the same way of thinking called a Wealth Mindset. Though a Wealth Mindset includes both Financial Literacy and Entrepreneurship, the importance of the eight additional elements escapes most people. This way of thinking is something that is either acquired over time by growing up around money or by simply changing the way one thinks about money and wealth. This way of thinking is also the same way by which any goal is achieved whether that goal is graduating from High School or making your First Million Dollars. The Student Millionaire Minutes are designed for the latter group. They are ten one-minute texts that capture the essence of the ten elements outlined in The Student Millionaire. The Minutes are intended to be read over the school’s PA system, in sequence, one Minute a day, repeating the ten Minutes every two weeks throughout the entire school year in all Elementary Schools, Middle Schools and in High Schools. The reason for doing it this way is for the neurological impact, much like a boxer learns to work a speed bag. He can work at it all day and not be very good. Or he can work at it two minutes a day for 30 days and be competent. And if he does this for a year, he becomes a pro. A Wealth Mindset is developed in much the same manner. It is developed over time by Young Adults keeping this overarching goal on their radar screen. It is important for our Young Adults to learn and adopt this attribute early in life and to have the courage and the confidence to create something that frees them financially to make their own choices in life, and to live life on their terms, not someone else’s. 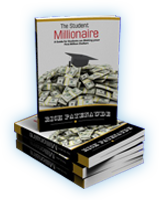 The Student Millionaire Minutes are attached and can be downloaded for your use. Dr. Dennis Kimbro, author of Think and Grow Rich: A Black Choice and his seven-year study of the Financial Elite in the Black Community The Wealth Choice has some choice words of his own to share with you about The Student Millionaire Minutes. Kindly click on Dr. Kimbro’s Testimonial below to view his comments.